It's easy to ignore the National Gallery. The front is now firmly guarded by human statues and reggae buskers, while the gallery itself seems too "obvious" to venture into. Nonsense: it's not world-famous without reason. And with late opening on Fridays, there's no excuse not to drop in for an hour or two after work. Monet - The Thames below Westminster: starting as I always do in the Impressionists' room, this one always gets me and I spent a while with it the other day. A smooth wash of sky and lack of colour evoke acrid smog brilliantly. Pale grey, yellow and beige are just so London all the way. 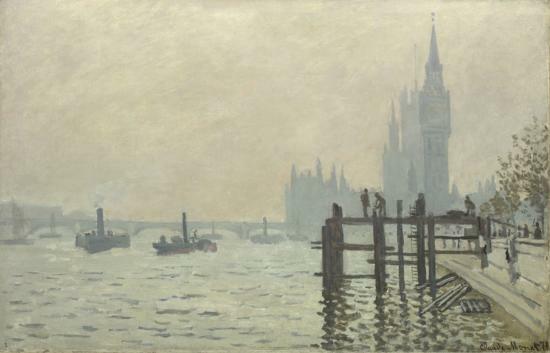 The Thames is so iconic, so stolid, when it's portrayed like this it makes me proud to be a Londoner! A classic for all time. 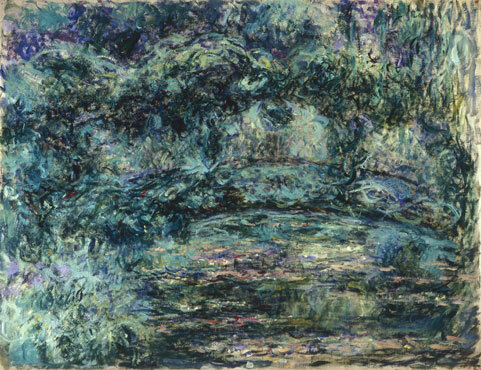 Monet - The Japanese Bridge: Tangles of lush green creepers dominate the work. A true Impressionist work: let your eyes drift slightly out of focus and be overwhelmed by the greens. This jpeg doesn't do it justice. The paint is smeared on roughly, almost aggressively; it's got a wild, jungle feel to it. 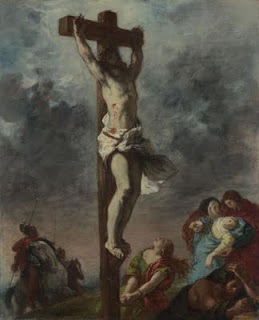 Eugene Delacroix - Christ on the Cross (1853): the worm's eye view is conventional enough, but the lighting, with Christ's face almost completely obscured by shadow, is startling. The pale skin tones suggest both the impending thunderstorm and Christ's vulnerability. 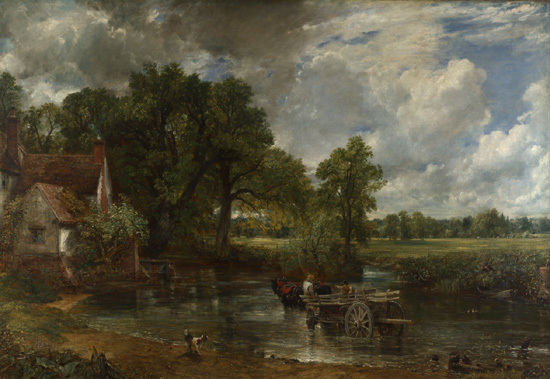 Constable - The Hay Wain: large, detailed pastoral scene from Constable's native Suffolk. 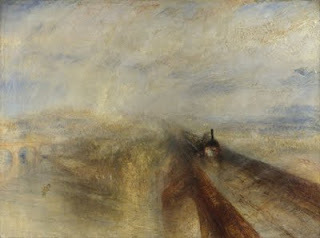 This is so different from Monet's painting of London, but in a completely different way, this is majestically English. Turner - The Fighting Temeraire, 1838: a grandiose but brilliantly portrayed sunset wrestles for attention with the main attraction - a warship being towed by a tug towards its doom. 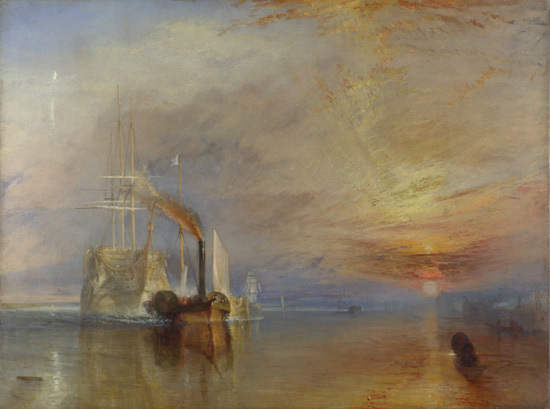 While the sunset catches he tug and highlights it, and an arrogant smear of rust coloured smoke points rudely at the warship, the Temeraire is pale, almost translucent: already nearly forgotten. Brilliant. 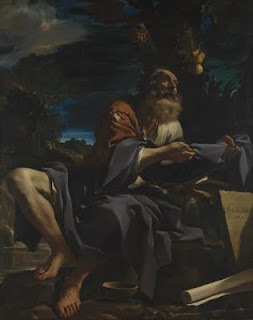 Guercino - Elijah fed by Ravens (1620): I'm pretty ignorant about Baroque art and I tend to get impatient with it, but this large piece is both dramatic and atmospheric. Elijah is presented as a figure of great power and wisdom. 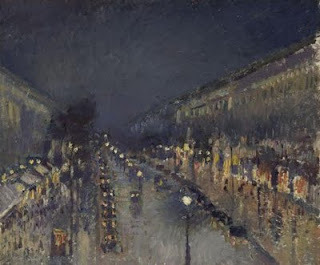 Pissarro - The Boulevard Montmartre at night (1897): a reminder why Paris is the second greatest city in the world! 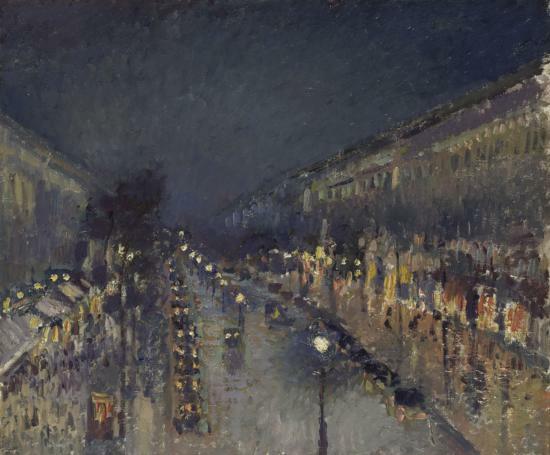 Ignore the crowds looking at Seurat's overrated Bathers at Asnières and head for this one instead. 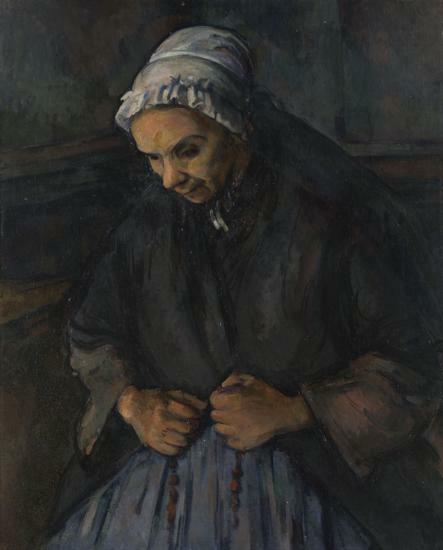 Cezanne - An old woman with a rosary (1896): this bleak work shows a world-weary woman - apparently a former nun - engrossed in her own decline. Her vulnerability and pathos are palpable. There's an interesting-sounding exhibition of Norwegian and Swiss landscapes at the moment - admission free.